Big Brother asked the Big Brother Naija Season 3 finalists re-pick someone to Head the House and though Cee-C had been sounded out, Alex firmly vetoed the idea. But Biggie had the last word. Regardless of the Finale, it looks like Alex and Cee-C are not ready to bulge an inch from their longstanding rancour. As the last five Housemates standing in the Double Wahala House, and given all had taken a turn in the Head of House Chair, it was suggested that Cee-C be given the chance, at last, to endorse the coveted role. While suggestions for her appointment were made in a rather casual way, Alex had no intention to keep her feelings under wraps. She requested the House passed a Vote and indicated her opposition to Cee-C’s becoming the last Head of House. If there’s one thing Alex can be counted on, it is to tell it like it is, without sugar-coating it, and today was no different. She had earlier confessed to Tobi wanting to slap Cee-C to rest her brain but the possibility of Biggie issuing her with a Strike prevented her from doing so. Cee-C on her end is not entirely blameless to say the least. 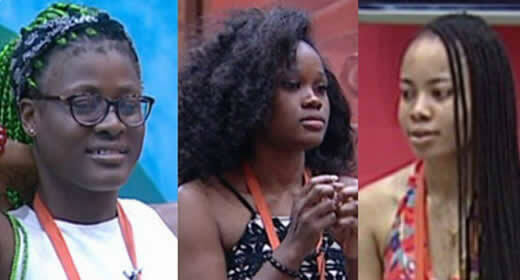 From the start of the game, she had made no attempt at hiding her contempt for Alex - and if prompted to, Cee-C’s eyelashes could even testify in Alex’s favour. Judging by the constant frown on her face since Cee-C’s surprise return to the House following the last Eviction Show, Cee-C has a lot of emotions bottled up about Alex too. However with no shoulder to lean on in the House, Cee-C has had to refrain from airing them. By general consensus, and for the sake of peace, Nina stepped into the Head of House role with gusto for the very last time. The run-up to the Finale has suddenly taken a more torturous meaning altogether. Biggie decided to intervene and set the Housemates straight about Cee-C, the Housemate with the least Head of House record should be the new leader. Against all odds, Cee-C was imposed upon the House, to everyone's bitter surprise. Do you think Alex and Cee-C will settle their scores off-camera, after the Show?